One day when I need some clean nylons quickly, I hand washed in the sink, and spun-dry in my salad spinner! In no time at all, they were ready to wear! Another story... Yes, I can be a klutz! I was using the cheese grater one day and accidentally grated the Jamberry Nail wrap I was wearing. I thought my wrap was ruined, but a quick file with a glass nail file, and they looked fabulous again! 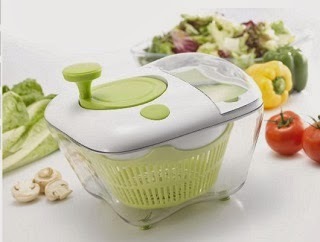 -- With a choice of cutting inserts and graters, you can create more than salads with this versatile kitchen helper. Chop apples, potatoes, cheese, and julienne style french fries; create ingredients for soups, stews, vegetable side dishes, and more.